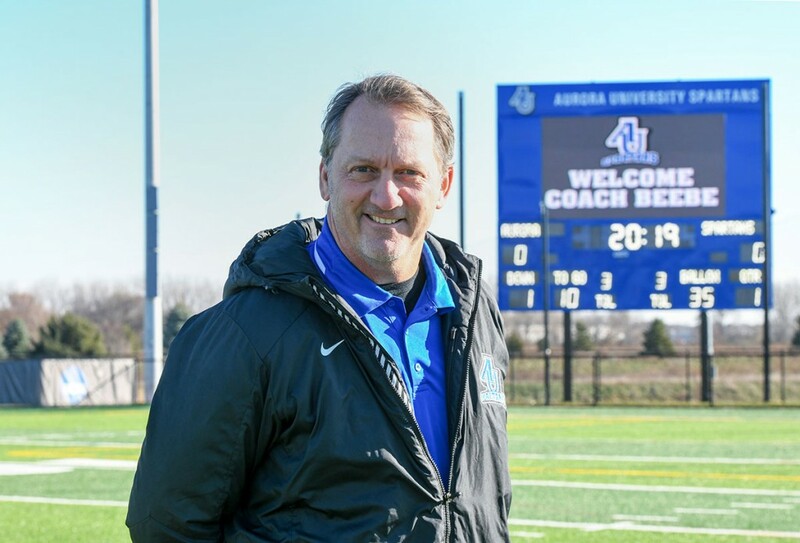 Aurora University is pleased to announce National Football League (NFL) legend Don Beebe as the Spartans football new head coach, effective immediately. Beebe, highly regarded by coaches, players and fans for his strong character, robust work ethic and perseverance, embodies Aurora University Athletics’ core values of academic success, social responsibility and athletic championships. A wide receiver in the NFL for nine years — including six Super Bowl appearances and one championship — Beebe is widely known for his “never-say-die” grit displayed in Super Bowl XXVII when he denied Leon Lett an easy touchdown. After retiring from the NFL, Beebe founded House of Speed, in Aurora, which specializes in training athletes to perform better by enhancing speed and character. He also coached Aurora Christian High School to two state championships. Beebe grew up just down the road from Aurora University in Sugar Grove, Ill., graduating from Kaneland High School. He attended AU and played Spartan basketball for one season. While playing football at Chadron State College in western Nebraska, his speed caught the eye of NFL scouts. He was invited to NFL combine trials in Indianapolis in 1989 where he (and Deion Sanders) ran the 40-yard dash in a record-setting 4.25 seconds. Beebe was the Buffalo Bills’ first pick in the draft. After retiring from the NFL, Beebe founded House of Speed in Aurora with Dr. Jeff Schutt in 1998. House of Speed has trained 100,000 athletes of various levels and sports, including more than 40 professional athletes such as Dallas Cowboy quarterback Tony Romo and Michael Turner of the Atlanta Falcons. Beebe coached football at Aurora Christian High School from 2004 to 2013, leading the team to three state championship appearances and two championships. Beebe is a sought-after motivational speaker and in 2012 published a memoir, “Six Rings from Nowhere” chronicling his journey from construction worker to NFL record holder. He lives in Aurora with his wife, Diana. His son, Chad, is a wide receiver with the Minnesota Vikings. Two of his three daughters play volleyball (one in high school, one in college) and his third daughter recently gave birth to Beebe’s first grandchild. He is involved in a number of charitable organizations, including Make-A-Wish Foundation, Fellowship of Christian Athletes, Athletes in Action and the Cystic Fibrosis Foundation. Founded in 1893, Aurora University is a four-year, private, nonprofit, fully accredited higher education institution offering students an excellent education while maintaining one of the lowest private tuition rates in Illinois. Aurora University is nestled in a tree-lined neighborhood in Aurora, the second largest city in Illinois, and located approximately 40 miles from Chicago. The university serves more than 3,900 undergraduate and 1,900 graduate students across more than 40 majors and programs. AU leadership, faculty and staff are committed to the success of our students, offering academic support programs, hands-on learning activities, internships and community partnership opportunities that prepare students to be successful beyond AU.